Wake up and dream: "Spiritual bypassing" - spirituality as way of avoiding our shadows. Time to step toward our pain. "Spiritual bypassing" - spirituality as way of avoiding our shadows. Time to step toward our pain. When I read this, I saw myself clear as ever. Wow. Used spirituality as a sort of escape from reality, or as a way to avoid some painful aspect of your life? Let yourself get taken advantage of or walked all over in the name of blind compassion? Allowed your understanding of ultimate reality to help you avoid or push away your anger, believing such negative emotions to be "lower" or "less spiritual" than your enlightened ideals? Used spiritual (or integral) terminology to relabel your own shadows, paving over the potholes in your own personality?" "If you are being completely honest with yourself, odds are you would answer "yes" to one or more of these questions. It might be difficult to admit--in fact it might be so subtle and so insidious it's difficult to evensee. But don't worry: you are not alone. In fact, we would be hard pressed to name a single teacher or practitioner who hasn't fallen into similar traps at one time or another. Fortunately, we have people likeRobert Augustus Masters and Ken Wilber to help us recognize, confront, and embrace these flickering shadows of spiritual bypassing--offering us a path from from self-deception to self-liberation, from idiot compassion to enlightened action, from effete escapism to the moment-to-moment enactment of infinite and boundless love." Excellent work. Here is a wonderful discussion worthy of 20 minutes of time to listen. 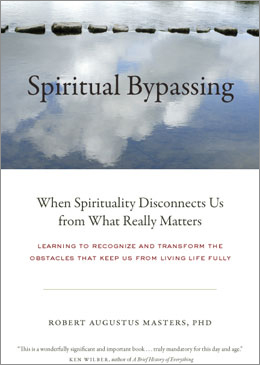 And the book "Spiritual Bypassing: When Spirituality Disconnects Us from What Really Matters"
yes indeed Ken has been digging this up for me and stepping all over my "spirituality!" Hopefully my hole is not nearly as narrow now....glad your sharing this!